In Part I of this article [LJ, November 2002], we saw how ptrace can be used to trace system calls and change system call arguments. In this article, we investigate advanced techniques like setting breakpoints and injecting code into running programs. 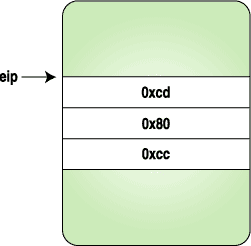 Debuggers use these methods to set up breakpoints and execute debugging handlers. As with Part I, all code in this article is i386 architecture-specific. In Part I, we ran the process to be traced as a child after calling ptrace(PTRACE_TRACEME, ..). If you simply wanted to see how the process is making system calls and trace the program, this would be sufficient. If you want to trace or debug a process already running, then ptrace(PTRACE_ATTACH, ..) should be used. When a ptrace(PTRACE_ATTACH, ..) is called with the pid to be traced, it is roughly equivalent to the process calling ptrace(PTRACE_TRACEME, ..) and becoming a child of the tracing process. The traced process is sent a SIGSTOP, so we can examine and modify the process as usual. After we are done with modifications or tracing, we can let the traced process continue on its own by calling ptrace(PTRACE_DETACH, ..). 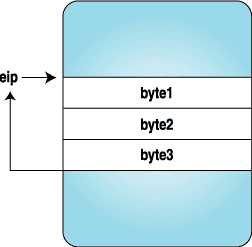 The above program simply attaches to a process, waits for it to stop, examines its eip (instruction pointer) and detaches. To inject code use ptrace(PTRACE_POKETEXT, ..) and ptrace(PTRACE_POKEDATA, ..) after the traced process has stopped. 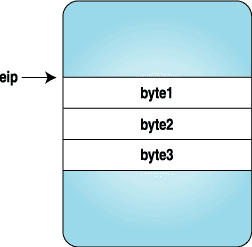 printf("The process stopped, putting back "
Here we replace the three bytes with the code for a trap instruction, and when the process stops, we replace the original instructions and reset the eip to original location. 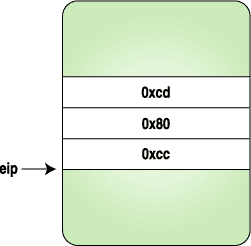 Figures 1-4 clarify how the instruction stream looks when above program is executed. Now that we have a clear idea of how breakpoints are set, let's inject some code bytes into a running program. These code bytes will print “hello world”. The jumping backward and forward here is required to find the address of the “hello world” string. printf("Letting it continue with "
So what happens within the kernel now? How is ptrace implemented? This section could be an article on its own; however, here's a brief description of what happens. When a system call entry is done, the kernel checks this flag and calls the trace system call if the process is being traced. The gory assembly details can be found in arch/i386/kernel/entry.S. Now, we are in the sys_trace() function as defined in arch/i386/kernel/ptrace.c. It stops the child and sends a signal to the parent notifying that the child is stopped. This wakes up the waiting parent, and it does the ptrace magic. Once the parent is done, and it calls ptrace(PTRACE_CONT, ..) or ptrace(PTRACE_SYSCALL, ..), it wakes up the child by calling the scheduler function wake_up_process(). Some other architectures can implement this by sending a SIGCHLD to child. ptrace may appear to be magic to some people, because it can examine and modify a running program. It is generally used by debuggers and system call tracing programs, such as ptrace. It opens up interesting possibilities for doing user-mode extensions as well. There have been a lot of attempts to extend the operating system on the user level. See Resources to read about UFO, a user-level extension to filesystems. ptrace also is used to employ security mechanisms. All example code from this article and from Part I is available as a tar archive on the Linux Journal FTP site [ftp.ssc.com/pub/lj/listings/issue104/6210.tgz].